The Mt. 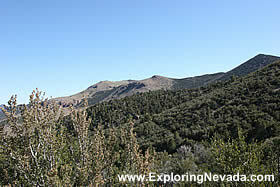 Wilson Backcountry Byway scenic drive is an 81-mile drive through the heart of the remote Nevada backcountry. The route goes through the heart of the Wilson Creek Range, providing the traveler with a mix of desert and forested terrain. The drive provides superb views of Lake Valley and the surrounding countryside. The drive also passes close to Echo Canyon State Park and goes right through Spring Valley State Park. The Mt. Wilson Backcountry Byway is a designated National Byway. The Bureau of Land Management maintains the route. However, while the route is designated a “National Byway,” the drive, especially in the higher elevations of the Wilson Creek Range, can be rough. Although a four-wheel drive vehicle isn’t needed to drive this route except during the worse weather, a high-clearance vehicle can be a real life saver. The upper elevations of the drive are prone to large, deep ruts. A low-clearance passenger car likely will have problems navigating around these ruts safely. Travelers also need to be aware that the signage of this byway is, simply stated, terrible. Other than one big sign in Pioche that marks the beginning of the drive, there is no signage at all along the route. As such, anyone planning to take this route MUST have either one of the route guides that BLM passes out at their Ely office, or preferably, should purchase one of the topographic map books of Nevada such as the DeLorme Nevada Atlas & Gazetteer or the Benchmark Nevada Road & Recreation Atlas. The reason a traveler should have a map book is because the Mt. Wilson Backcountry Byway follows a series of gravel roads. It’s not just a simple matter of hopping on a road and following it to the end. As such, the traveler will need to feel comfortable reading maps and making “good guesses” on which road is what. Due to the relative lack of roads in this area of Nevada, it isn’t hard to make “good guesses” at road junctions. As a rule, simply staying on the “best quality” road when confused will keep the traveler on the correct route. However, there definitely exists the possibility of making a wrong turn and ending far away from the route if a mistake is made in reading the map. Now, with that all said, why would anyone want to take this scenic drive? Simple. It’s scenic! 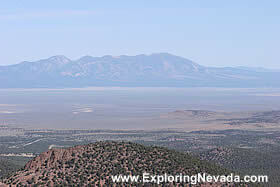 The drive penetrates deep into a remote area of Nevada few people ever visit. Although the drive begins and ends in the high desert terrain, during the middle of the drive the road twists and turns through rolling, forested mountains offering superb views and complete isolation. The traveler can begin the Mt. Wilson Backcountry Byway scenic drive either in Pioche (at the US Highway 93 and State Highway 322 junction) or at the Pony Springs Rest Area, which is located twenty-five miles north of Pioche on US Highway 93. Although the beginning of the drive is clearly marked in Pioche as it follows State Highway 322, my suggestion is to begin the drive at Pony Springs Rest Area since I think the route is easier to follow going this direction. By beginning at Pony Springs, the traveler is less likely to accidentally stray off the route, as the road choices in the northern part of the drive are much more limited. There are no services on the Mt. Wilson Backcountry Byway. The best place to get supplies and gas is in Pioche. For those wanting to spend the night in the backcountry, there is no shortage of places to go. Virtually the entire route passes through BLM land. As such, the traveler can camp anywhere they desire. Additionally, Spring Valley State Park, which contains Eagle Valley Reservoir, has two developed campgrounds. A few small, locally owned motels are in Pioche, too. The traffic on the Mt. Wilson Backcountry Byway scenic drive is light to non-existent. Most of the traffic found is between Pioche and Spring Valley State Park – a distance of sixteen miles. Beyond Spring Valley Park, there is virtually no traffic whatsoever as, quite simply, there is nothing there! Overall, the Mt. 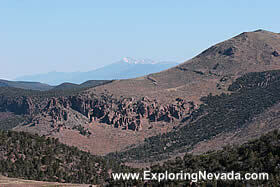 Wilson Backcountry Byway is a superb excursion through the remote Nevada backcountry. For those who are driving through Pioche on US Highway 93 and have a few extra hours (or more) to spare, this scenic drive is highly recommended. Just be sure to have a good map book. Trip Length : 81 miles, one-way. Starts and ends on US Highway 93. Drive can begun either in Pioche or 25 miles north of Pioche at the Pony Springs Rest Area. Road Type - The road is paved between Pioche and Spring Valley State Park (16 miles). Beyond Spring Valley Park, the road is gravel. Generally, the road is in good condition. However, the road can be a bit rough with deep ruts at times as it crosses through the higher elevations of the Wilson Creek Range. For this reason, high-clearance vehicles are recommended for the gravel road portion of this drive. Services Available - Gas and supplies can be found in Pioche. There is no place to buy supplies or gas on the scenic drive. General Location - Eastern Nevada, 25 miles north of Caliente. Drive is off US Highway 93. Camping - For most of the drives length, the road passes through BLM lands. Thus, there is no shortage of camping spots. Developed campgrounds also exist at Spring Valley State Park, sixteen miles outside of Pioche. Bring your tent or camper, as there is no lodging or services of any kind on this scenic drive. The good news is that there is plenty of camping available. As the drive passes through BLM land for almost its entire length, primitive camping is available everywhere. More developed camping is also available at Spring Valley State Park and Echo Canyon State Park.